The Sphinx is an integral part of the funerary complex of Khafre and was apparently carved from an outcrop of local limestone rock left after the quarrying of blocks for the nearby Great Pyramid of Khufu. It is a crouching, human-headed lion that represents Re-Harakhte, the sun god at his eastern rising at dawn. Some recent nonsensical theories have suggested that the Sphinx is many thousands of years older than the pyramids, but there is no foundation for such fantasies. Its face is believed to represent Khafre and, as such, is the oldest large-scale royal portrait known. The Sphinx is about 66 ft (20 m) high and 240 ft (73 m) in length. For most of the last four and a half millennia it has been enveloped in sand. A large stele before its chest records that in c. 1419 BC the young prince Tuthmosis (later to be Tuthmosis IV) cleared away the sand that engulfed it (pp. 113-14). In recent years, since it is no longer protected by its sand covering, deterioration has been very noticeable, especially from rising ground water, and a large piece of rock weighing 30 kilos fell from its right shoulder in February 1988. This was restored and a full recording and conservation programme begun. The necropolis at Giza was to be completed by Khafre's son, Menkaure (Mycerinus), who came to the throne in about 2532 BC. If you think the theories of the pyramids at Giza being built many thousands of yrs before your timeline, then YOU must be OUT OF YOUR MINDS. 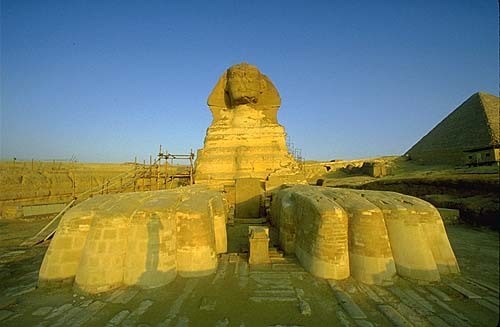 Also, the sphinx was built during the age of Leo,not for the sun god. Maybe it is time for you to rethink YOUR lineage since the limestone they were each quarried from could not have been done by ancient egyptian man at the date you suggest.